Some stories seem too awful to be true, and the story of a vet in Heswall, on the Wirral, definitely falls into that category. A Jack Russell had been brought into the Churchview Veterinary Centre in Heswall to have his stitches removed after receiving treatment for cutting himself when he ran into a wall. Rather than remove the stitches, the ‘trainee’ vet made a further cut in the dog’s side when her hand slipped, slicing the dog open with a knife. The dog yelped in pain and had to be held down while the new wound, which was parallel to the original wound, was treated by the real vet. 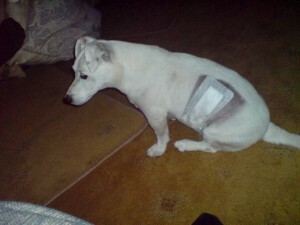 Astonishingly the vets then charged the owner for treating the new wound which they had inflicted! This is the sort of story that would outrage dog lovers everywhere, and one that should make dog lovers wary of taking their dog to the vets. Read the full story here, but be warned, it’s not a pleasant one.